Every sari, with its exquisite designs, has a fascinating story to tell. Its motifs, some of them centuries old, are popular to this day and have typically been inspired by exquisite temple art or drawn from nature. It is true that the weaving tradition of Tamil Nadu is unique, and the reason lies in its designs and motifs which have stood the tests of time. 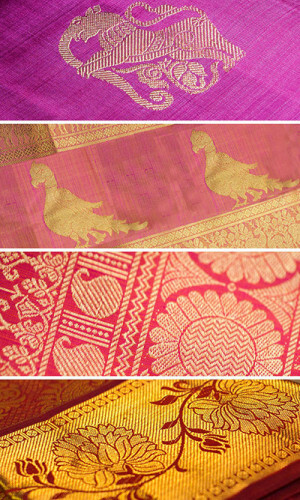 The following are some of the most popular motifs that feature in Tamil Nadu sarees. Mayilkann signifies the ‘peacock’s eye’. It is an ancient motif, inspired by Hindu mythology. Indra, leader of the Devas, once hid under a peacock’s wing from the demon Ravana and in gratitude, is said to have bestowed the bird with 1000 eyes on its tail. The mayilkann motifs are typically woven closely together across the body, pallu or along sari borders. The glittering ‘eyes’ bring alive a timeless tradition of elegance on a sari. Maangai or mango motif has captured the hearts of womenfolk since time immemorial. From tiny mangoes strung along the sari border to mango ‘buttas’ on the body of the sari or even large mango patterns on the pallu – the mango motif is used in myriad ways. The annapakshi or mythical swan is one of Tamil Nadu’s most distinctive cultural icons. Depicted in temple architecture as a plump-breasted bird with ornate tail feathers, the annapakshi, according to mythology has white plumage symbolizing purity of spirit. A row of strutting annapakshis makes for a rich, arresting border. Woven as a large zari motif on the sari pallu, the annapakshi is positively magnificent! The ‘neli’ is an enduring aspect of Tamil culture and the motif based on it translates into wavy lines. A ‘neli modhiram’ is a deeply curved, U-shaped ring, typically with a precious stone nestling at the base – perhaps the inspiration for the alternating dots that sari weavers incorporate into this motif. Married women adorn their feet with ‘neli’ toe-rings. Many nature inspired motifs have evolved over the years, but the traditional “kodi” – that is vine/creeper design has maintained its own over the decades. The intricate leaves are woven sometimes all over the body of the sari in the form of ‘buttas’, or sometimes delicately adorn only the border.